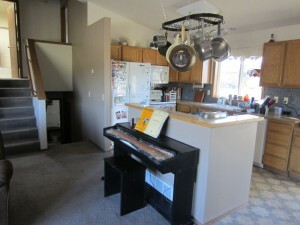 View of the kitchen, from the living room (before remodel). 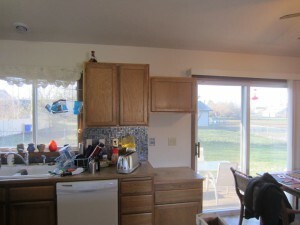 Note in the background, there is an empty space on the wall between the existing cabinets and the sliding-glass door, with a lower base cabinet underneath. We were thinking that rather than the tall pantry cabinet that was behind that wall cutting us off, maybe we would rather have an island with a countertop. 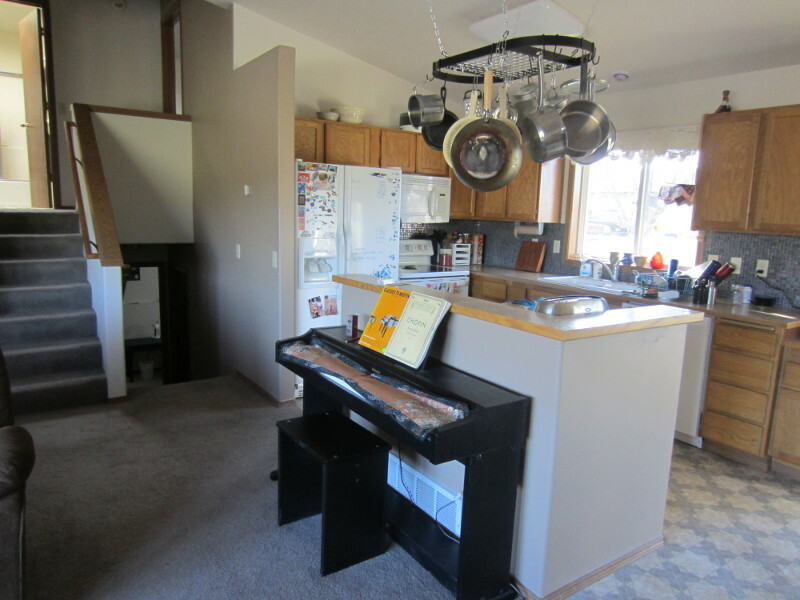 This would open up the space for sociability, and at least double our usable counter space, at the cost of a few cubic feet of cabinet space. 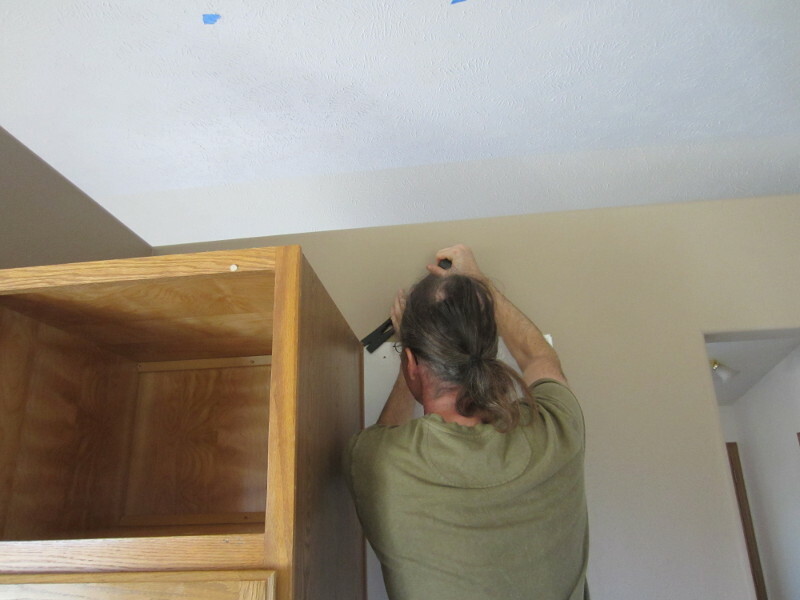 To partially mitigate the loss of cabinets, we also thought about adding a small wall cabinet to the right of the existing cabinets (see first photo). 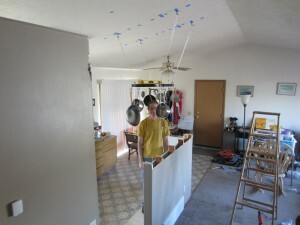 Then we had the idea of a hanging pot rack, to provide space for our pots and pans. Then we kept thinking. And thinking, for a few years. This spring, we took a look at our budgets, and decided that we were ready to do the job! 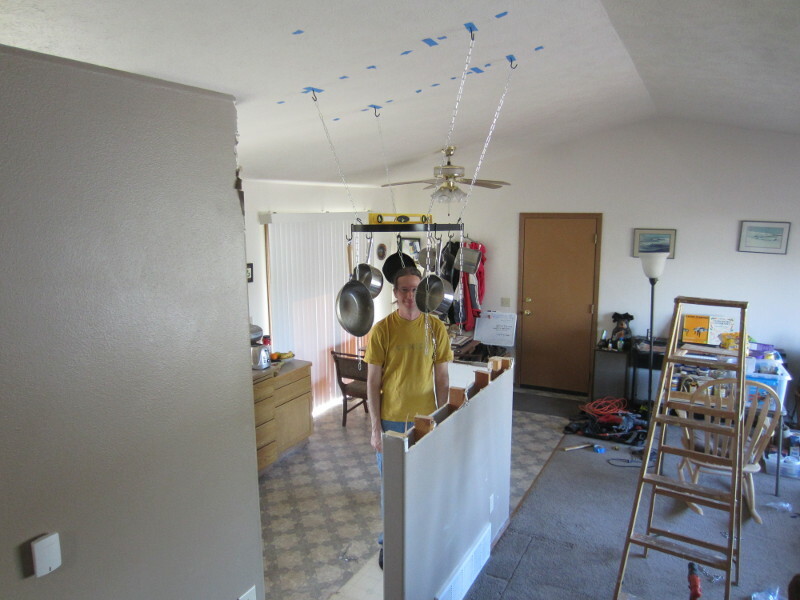 Zach and I are both somewhat handy at some things around the house…. 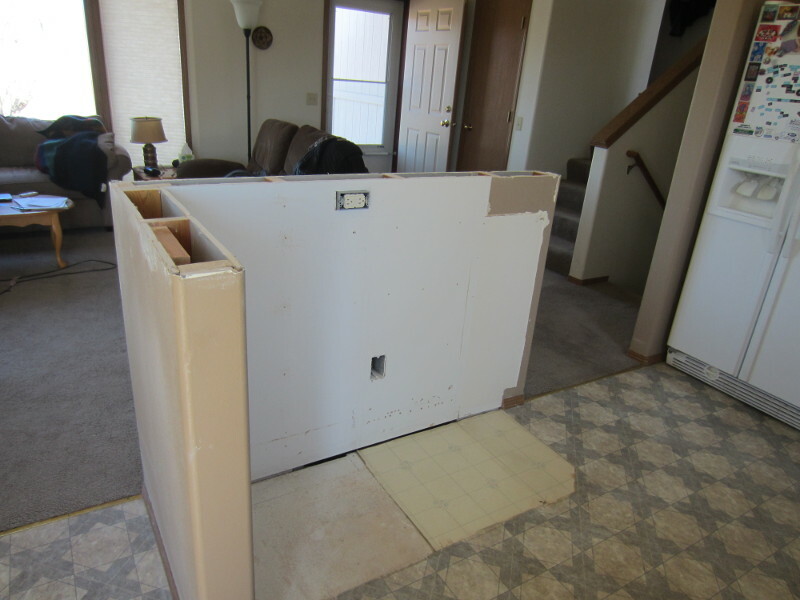 But we know our limitations, and we wanted to make sure that the cabinets were installed properly (level, etc.) 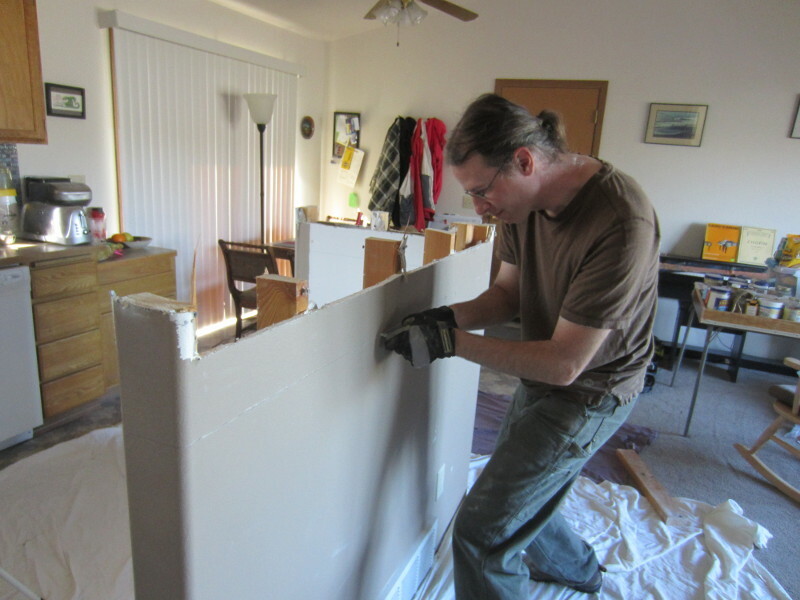 — and this was beyond what we were comfortable doing, so we needed to hire a contractor to do it. We had a hard time finding someone who was interested in taking on the job, until we found that a local cabinet manufacturer, Huntwood, would do it for us, as long as we did the demolition work. The job went fine… here are some photos of the process. Zach tearing out the wallboard. This may have generated some dust. 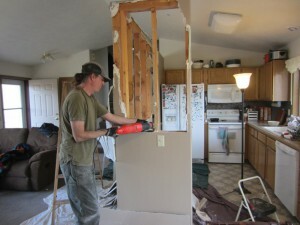 Note the kitchen stuff from the cabinets we removed, which is in the living room in the background. 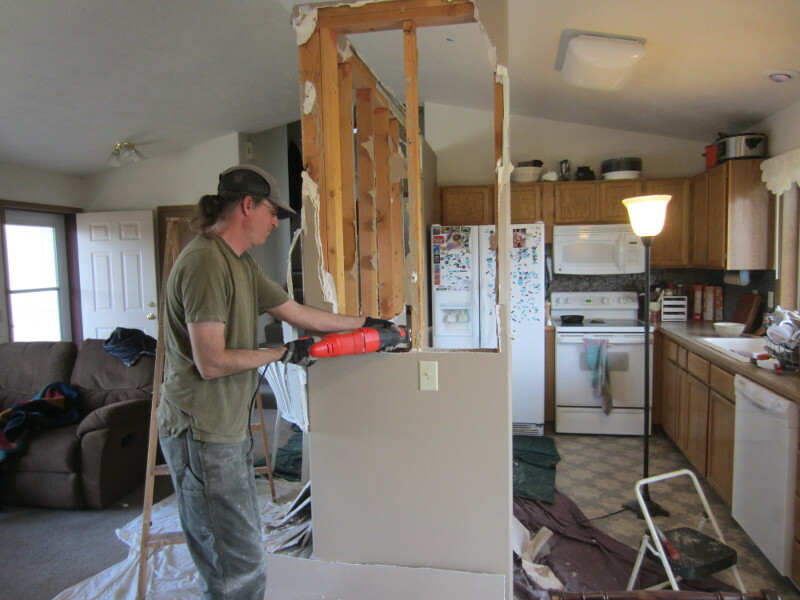 Zach sawing off the studs to complete the wall removal. This may have generated some more dust. Honey, I think the pot rack needs to be a little higher up? The second pass at wall removal got it down to the final height, plus smoother and more level. This may have generated some more dust. 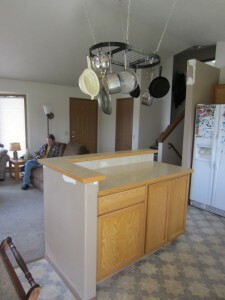 Hm, maybe we should have put drop cloths over the kitchen stuff that was in the living room? Oops. 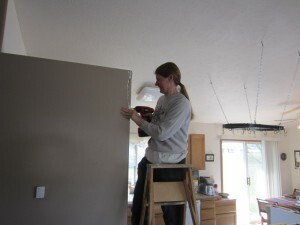 Jennifer gets into the action, starting the rebuild and refinish of the walls. 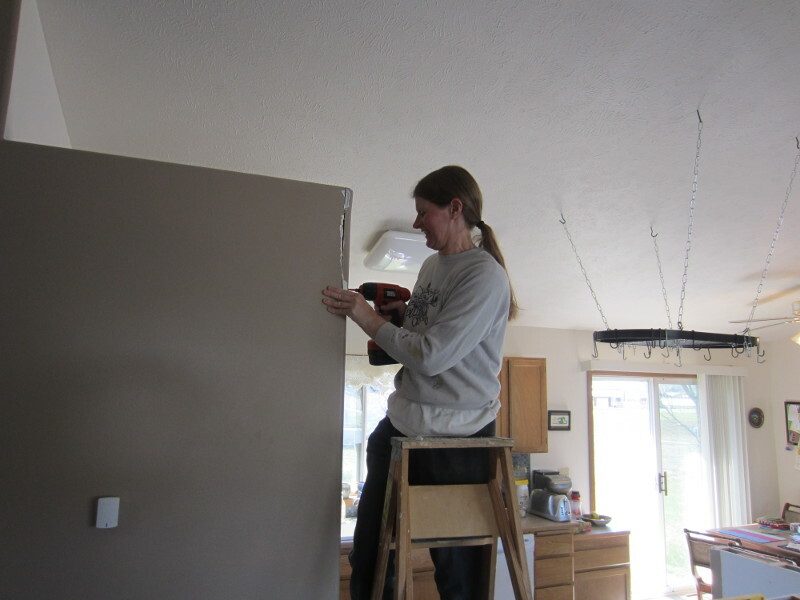 Jennifer also removed a light switch (on the left — it had been a 3-way switch; now there is just the one switch for the dining room light). And she removed an outlet that was (why??) 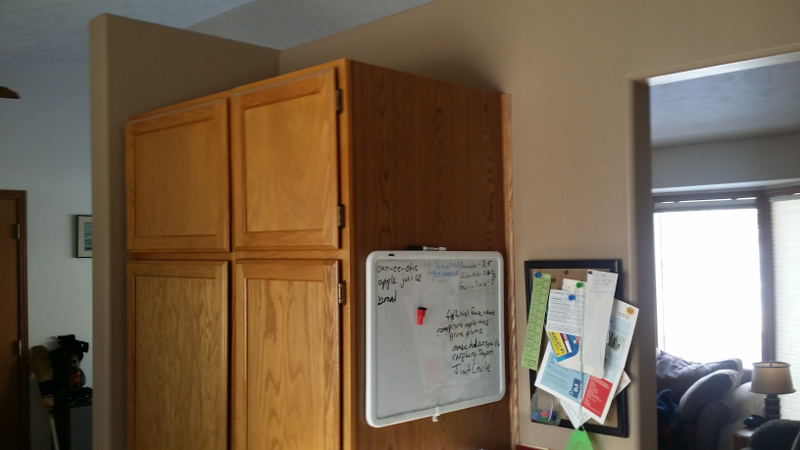 behind the old cabinets, and put in a new outlet above the new counter space. Now, the wall is ready for the cabinet install! The installer started with the wall cabinet. We bought a box cabinet (no doors), and recycled the door and hinges off the top of the pantry cabinet, so it would match the color and style of the existing cabinets better. 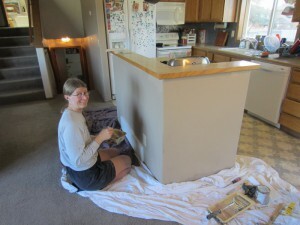 The base cabinet, its countertop, a backspash, and a small “bar” went in next. The wall is still a bit rough in places… but the countertop and cabinets are very close to the style and color of the existing cabinets. And voila! From the living room, you can now see the kitchen. Great job, guys, can’t wait to see it in person!! Nicely done! Look forward to seeing it in person one of these days. Hope you were able to get all the dust out/off! You have a lovely home and it’s more YOURS now! 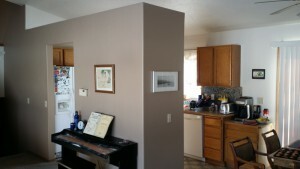 Hey I have a wall between my kitchen and living room I want to take down! 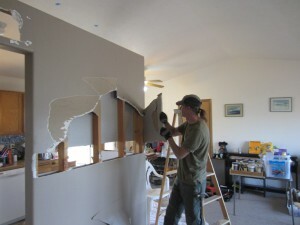 I have seen Geoff’s handy work and don’t trust him with such a demanding project… How much do you guys charge? ?